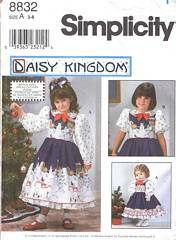 Child's dress and pinafore pattern and doll dress pattern for 18 inch dolls such as American Girl. Copyright 1999, now out of print. Pattern is uncut and in original factory folds. Envelope has some storage wear to edges.